Kids' Corner encourages children to connect with the history and objects on display in the museum through fun, interactive activities and displays. There is a collection of old-fashioned costumes to try on, toys to play with, pictures of objects in the collection to colour in as well as a beanbag and books to read and enjoy. It is situated within Hampstead Museum. The Family Trail engages children with the museum displays by asking them questions and encouraging them to lift flaps, press buttons and play with the old-fashioned telephone as they look for the answers. Year 4 students from New End Primary School (around the corner from Burgh House) wrote the questions and drew the pictures for the trail during their Kids in Museums' Take Over Day in November 2013. Pick one up for free at the entrance to Hampstead Museum on the first floor. 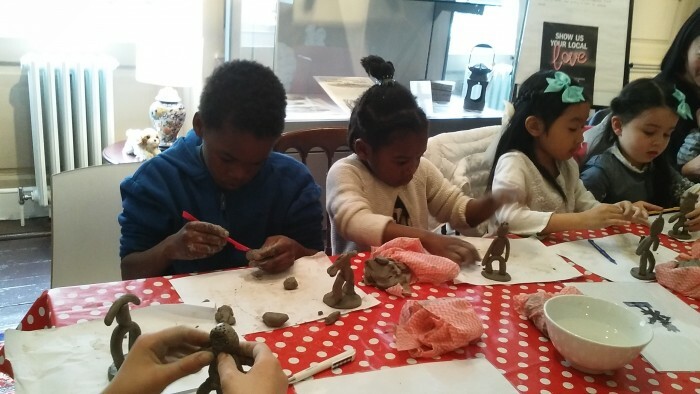 Come and join us for this family friendly clay workshop inspired by the renowned sculptor Barbara Hepworth. This activity is suitable for children 5 and over. Join us for a session on illustration inspired by Kate Greenway, a local children’s illustrator depicted in our temporary exhibition ‘All that I’m Capable of Becoming’. This activity is suitable for children 5 and over. As part of the House wider celebration for International Women’s Day join us for the Family Friendly Tour. Suitable for children 7 and over. £5 per child, available from www.burghhouse.org.uk. Children must be accompanied by an adult.